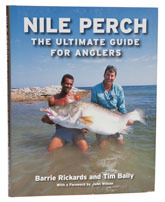 This is a good one to read back to back with The Little Book of Little Fishes – few of Mark Everard’s fish go bigger than about quarter of a pound, whereas Tim and Barrie’s book doesn’t bother mentioning Nile perch weighing less than about twenty. This is very much a how-to book and it is mostly about the fishery on Lake Nasser in Egypt, but if you want to learn about Tim Baily’s operation out there, I can’t think of a better way to do it. Tim has spent fifteen years creating a sport fishery on Lake Nasser and the book gives a great flavour not only of what it is like to fish there today, but what it was like in the early days, when the anglers slept on the sand under the stars and took their chances with the scorpions. Barrie is a veteran of Lake Nasser and well qualified to advise on how to catch these exciting and often extremely large fish, which run up to 550 pounds, although the rod caught record lies nearer to 200. Even if you have no intention of going to Egypt, Nile Perch is fun to read, full of accounts of the enormous power these fish have and the tremendous fight they can put up.